The suicide claim has not been confirmed. Witnesses said they heard several explosions and saw smoke rising from the base, at an airfield south-west of Mosul. Military officials initially said rockets or mortar rounds struck the camp, but Lt Col Paul Hastings, a spokesman for Task Force Olympia in northern Iraq, said the incident was still under investigation. "We do not know if it was a mortar or a place explosive," he said. Brig Gen Carter Ham, commander of Task Force Olympia said in a brief televised statement from Mosul: "It is indeed a very, very sad day. "The killed include US military personnel, US contractors, foreign national contractors and Iraqi army. 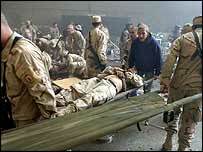 The wounded also come from those various groups." The BBC's James Reynolds, who was embedded with US troops at the base last month, says the dining hall was always seen as vulnerable. A US army colonel told him he feared what would happen if insurgents managed to fire rockets into it. The hall was shielded by towering concrete walls - but it had no protected roof. The army was building a more fortified dining hall nearby, our correspondent says. The Mosul attack came as UK Prime Minister Tony Blair made an unannounced visit to Baghdad, 370km (250 miles) to the south. It was his first trip to the capital, where he held talks with interim Iraqi Prime Minister Iyad Allawi and other officials. In Washington, the White House said US President George W Bush condemned the Mosul attack, and regarded as a sign of the insurgent forces' desperation. Mr Bush "mourns loss of life" said White House spokesman Scott McClellan. An ABC News/Washington Post poll suggested on Monday that a majority of Americans now believe the war in Iraq was not worth fighting. Two French journalists held hostage in Iraq since August are freed. US carries out an overnight air strike on the town of Hit, in a Sunni Muslim region west of Baghdad, killing six people and wounding 10, according to hospital officials. Gunmen assassinate a local government official in Diyala province on his way to work. Mosul, Iraq's third biggest city, has experienced a spate of attacks since the middle of November, when insurgents overran police stations, looting weapons. Much of the city centre is off limits to Iraqi security forces and US troops, who have been the target of daily attacks during the last month. Ansar al-Sunna has claimed a string of attacks on Iraqi security forces and foreign workers, often taking hostages and murdering them.